The opening is bright and citrusy, and it is green, but it's a very soft, dewy and pale sort of green (it reminded me a bit of the Martin Margiela Untitled scent) with plenty of violet leaf (which reminds me of too many fragrances to list). On paper, the green opening lasts for ages, and the violet leaf predominates, but on skin, that and the florals — a brief whoosh of something that could be lily of the valley, I suppose, although it could just as easily be another vaguely peony-ish spring flower blend — fade rather quickly into a mild amber-y musky woods, lightly smoothed over with some powdery iris. It's a bit warm and mostly quiet; I would call it seasonless and unisex. Verdict: Nicely done if not particularly exciting or unusual, and anyone hoping for a burst of weirdness from the edamame accord is bound to be disappointed (Ari at Scents of Self: "Let’s get this out of the way: B. sounds more interesting than it smells. ")3 It's more sophisticated than Florabotanica, and it would make a decent no-brainer fragrance for those days when you need something pretty and wearable but unchallenging. Even for quiet elegance, though, I don't like it nearly as much as Balenciaga Paris, the first Nicolas Ghesquière scent. The packaging looks nice enough but Ari says the bottle is sillier in person; do comment if you've seen it. 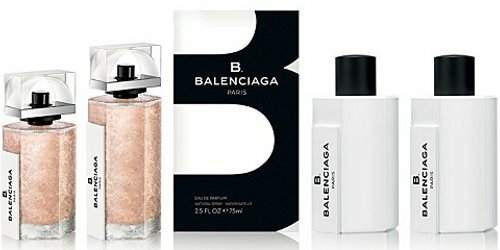 B Balenciaga is available in 50 ($110) and 75 ($145) ml Eau de Parfum and in a 10 ml Rollerball ($25), plus matching body products. It was developed by perfumer Domitille Bertier. The notes include lily of the valley, violet, green leaves accord, edamame accord, iris, cedar, ambrette seeds and cashmeran wood. 1. For anyone who missed the resulting kerfluffle, whereby Mr. Ghesquière made some comments to the press about Balenciaga "becoming a bureaucracy... until it was no longer even linked to fashion" and Balenciaga sued him for 7 million euros, that case has now moved to private mediation. 2. See A Moment with Alexander Wang in Paris: The Story Behind His First Perfume for Balenciaga at Vogue. 3. If you want a burst of weird + green, do try Dawn Spencer Hurwitz Wasabi Shiso! And of course do add your own recommendations in the comments. I read in Elle that this is titled “B.” and so pronounced “bee-dot,” which is just so humiliating that it put me off testing. What if someone asked you what you were wearing and then you had PRONOUNCE the DOT? Luckily, doesn’t sound like that would be much of a problem! Well, they can’t MAKE you pronounce it, LOL…just “bee balenciaga” is good enough for me. I liked Balenciaga Paris when i tried it a few days, but loved the Essenze flanker and bought a 15 ml bottle of it. Not surprised that this being nothing out of the box though, will try whenever I get chance though. Yes, that version was well done too…actually I think all of them are better done than most brands, including B Balenciaga. Would be nice if they did a darker flanker to this one too. Thank you for the review. I often wonder why more companies don’t put out a different masculine and feminine bottle designs with the same scent like Annick Goutal for scents that are not strongly traditionally masculine or feminine? I do appreciate the inexpensive rollerball option, but I can’t imagine needing another MM Untitled type scent in a less attractive (to me) bottle. This is NOT a dupe of MM though, and only similar really in the top notes. Could you compare this to a few other mainstream/designer scents, Robin? Just to get a better idea of what is smells like. Well gosh. It’s really too juicy & non-bitter in the opening to be “just like” Martin Margiela, but it’s in that sheer green family, also reminded me a bit of Cristalle Eau Verte, except juicier / a bit less “fresh”. Ends up in the latest minimalist slash powder style, warm-ish but with some lift (I think a bit of iso e super), if that helps…but that makes it like so many things that it’s hard to narrow down. Delacey below is right that it shares something with the original Balenciaga Paris, both stylistically and with the violet leaf note. I got a sample of this today. I’ve been excited to try it, hoping for a green-to-iris-to-wood progression. It wasn’t what I expected at all, and not in a good way. As Robin says, the green was very soft – I like her term ‘dewy’ – and the violet leaf was really predominant on me. I couldn’t find the iris. But worse, it barely lasted two hours. I resprayed later in the day, and again, it disappeared so fast on me. I wouldn’t say it was ‘like’ Paris or L’essence, but with these violet-based scents already out, I’m surprised at this, as it seems pretty similar for something that was supposed to mark a shift to a new designer. And I didn’t care for the bottle in person: the pink crackle looked rather cheap, and the cap was strange, fitting over the spray nozzle but leaving it exposed. Money saved for a different purchase, I guess! Thanks so much for chiming in about the bottle…it doesn’t look cheap to me in the photos, but that’s so often the case when you see something in person! I just saw it at my local Nordstrom’s. I rather liked the bottle, but I tend to like strange bottles, and not the prototypical ultra-feminine bottle. In fact, I love all the Balenciaga bottles. The juice for some of them, however…. Glad you liked it! Definitely a tartness in the top notes — on paper almost reminiscent of rhubarb, & thought it was perhaps part of what was meant to lend some “crisp” to the “edamame accord” business. On my skin though, it was really fleeting, hardly noticeable. I’m a fan of all of the Balenciaga scents, though I don’t own any, I am always excited to smell a new one. I love the rose one (which is in the same bottle as the original) and I think Florabotanica is well done. Their bottles are beautiful, but I really don’t like this one. It just doesn’t stand out to me like the beautiful bottles the other ones are in. I am excited to give it a sniff, however. I seriously cannot remember edamame smelling like anything. I can remember what tofu smells like, but not edamame. Admittedly, the color is very nice, and perhaps they are having a having a synesthesia moment. Aftelier Shiso smells more spicy than green to me. It’s very unusual, and I’ve never quite made up my mind about it. The description mentions an old Geisha formula and turn of the century spice oils, which is jogging my memory. It smells rather like a Japanese powdered incense that women sometimes wear in their hair as an old-fashioned perfume. For green, I like Diptyque L’Ombre dans L’Eau. I don’t think edamame has much smell…but I assumed they were going for a crisp vegetal green of some sort. I forgot about Shiso, thanks! You know, I did not read carefully and thought you were talking about Aftelier Shiso above rather than the DSH. Actually, I think the reason that I was confused by Aftelier Shiso is that I expected it to be green, which only happens for a split second at the very beginning. When I consider it as a spicy perfume, it makes more olfactory sense and I like it better. Among other things, it includes cassia, a cinnamon-like note, which is RED rather than green, right? And although shiso/perilla itself is a bit minty, it’s also peppery, and it’s this side that features in Aftelier Shiso. Ah, gotcha! I don’t remember Shiso well enough, I’m afraid — I think I would if it had been very green, though. I have this one – I asked a friend to grab me a bottle of Balenciaga Paris at Heathrow on the way home, and she brought me B. instead by mistake. I still love her. I was disappointed because I have a bit of an obsession with Balenciaga Paris and really need my stock replenished, but I have to admit I do enjoy this one. Everything in the review is true… a happy, easy scent you can wear any time. Though, one note that I smell quite clearly all day is peppermint (stronger in the winter). The bottle is meh… I find the cap is weird and ungainly. Will I buy this again when I’m done? Probably not but it has been fun so far. A fling, not a marriage.